How do i Operate and what do the OSD menu options mean? 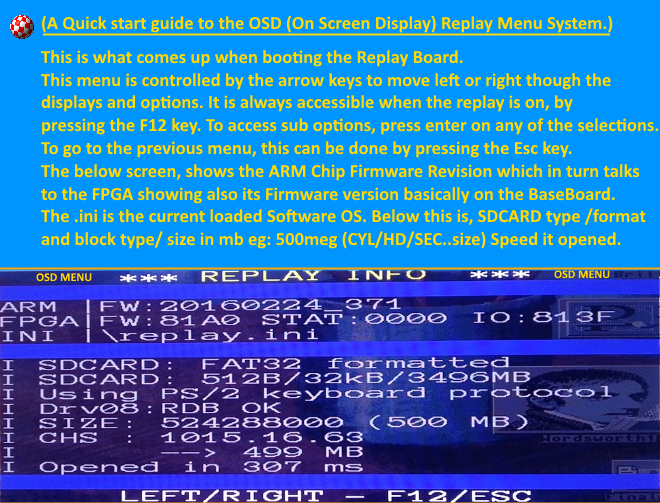 The OSD or (On Screen Display) is an overlayed menu system controlled currently by the keyboard. It will always be shown or toggled on or off by using the F12 key. Also, it is also independent of any core or rather any game or application that maybe running on the replay being its always displayed over the top of anything on your monitor or tv that maybe running. 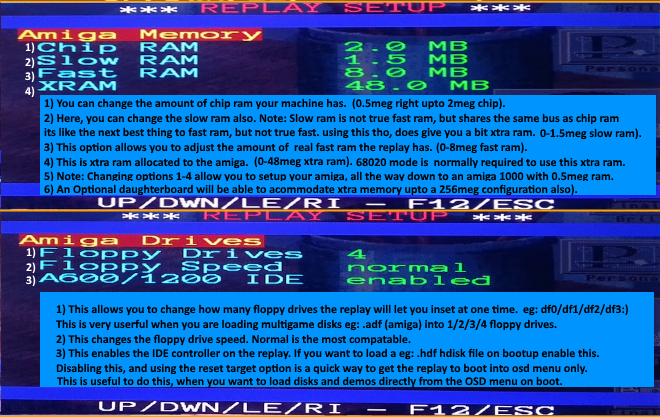 This allows you to change floppydisks or manage settings for example without rebooting the replay first. You can also move around the menu system by using the arrow Left right up & down keys and selecting items is also currently by pressing enter or return on the keyboard. To escape this is achieved also currently by using the ESC key. Options maybe added or and changed in future software revisions etc. Other control options may also include OSD control via a gamepad for example so you could control this on a big tv from the lounge. Also fonts and colors and backgrounds etc may also be updated. 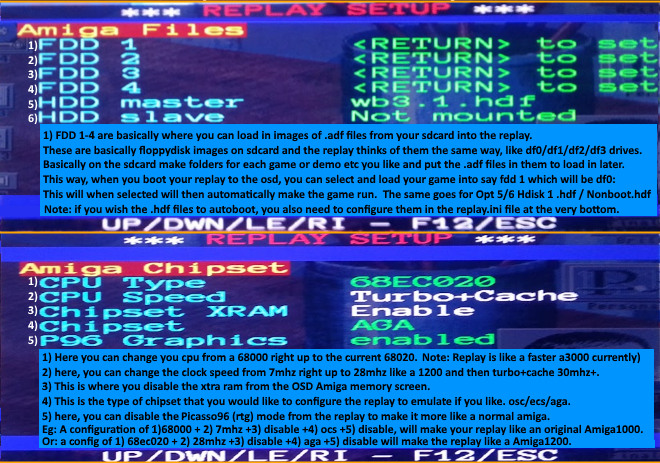 The Floppydisk files menu an the Amiga Chipset options screens. The Memory options and floppy and IDE Harddisk controls screens. 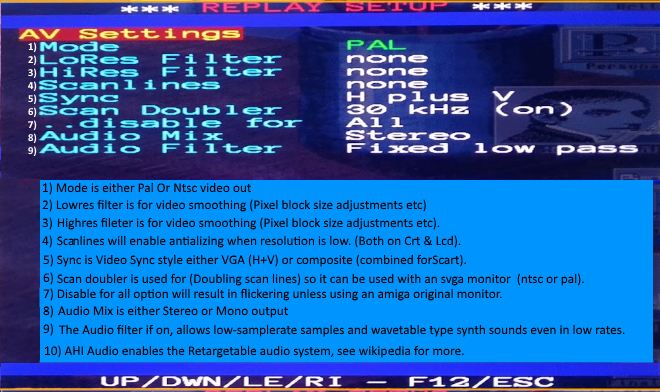 The Audio & Video options screen. 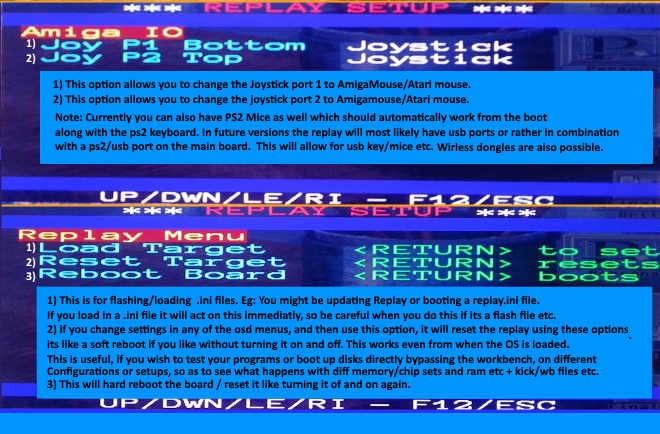 The Joystick & Mouse and Replay Flashing / Reset plus Core loading Option screens.